Svenska Eldvatten – Silent Swede Sauternes 61,2% ABV!!! Dear friends, followers, and supporters alike! When working at the Borlänge Beer and Whiskyfestival in November last year, Peter Sjögren of swedish independent bottler Svenska Eldvatten (Swedish Firewater) came by to tell me that if I wanted to I was welcome to pop by their stand to see if they had anything that I was interested in reviewing. 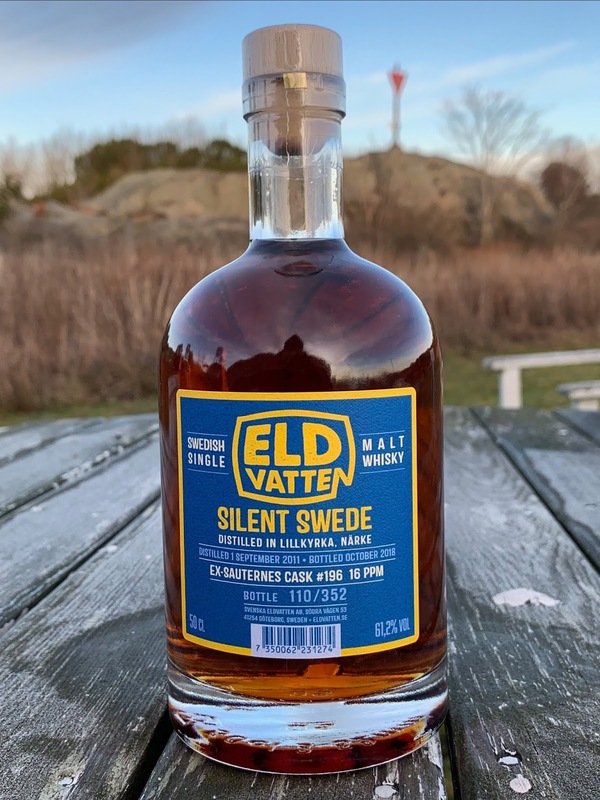 Well, of course I wanted to and of course they had; I instantly spotted their upcoming release Silent Swede (no.3) Sauternes, and so today I bring you my review of it! As can be understood from it's name the whisky has been produced at now defunct swedish distillery Grythyttan (a distillery that was located in Lillkyrka), and the whisky has been matured in a cask that previously held Sauternes wine from France. Some further details: the malted barley used has been peated to 16ppm, the cask size was 225 litres (hence a barrique) and gave a mere 352 bottles. The whisky has been bottled at an age of 7yo (201109/201810) at cask strength of 61,2% ABV. This whisky will be released at the swedish state-monopoly tomorrow (along with Silent Swede (no.4) Virgin French Oak) and you can view it by clicking here. Yesterday I sent a text to Peter simply asking for some more info on this series, and this is what he very kindly replied: "The idea behind Silent Swede is to create a whisky-library on a defunct swedish distillery, and hence create a series that will consist of only single casks, in full size. As usual we bottled these casks after having tried them and assured their quality, just as we always do! Since the quality of the whiskies that we try is the determining factor, the number of releases in this series has not yet been decided. The intention with this series is that the casks that we select will always and only be honest and straight forward single casks, in other words, no batches. The casks must deliver properly in order to at all come into consideration for a cask selection. To only get around 350 bottles from each full size cask at quite a young age can seem little indeed, but all the whisky that was in the casks when we bottled them has been bottled as Silent Swede, we haven't shared with anyone. We don't really know why the casks contained so small amounts of whisky but one factor that has a great influence on the volume is that the casks have not been matured in a particularly cold warehouse. This might also explain the high ABV". So, now that we know a little more, let's review! Incredibly raisin-y and very sweet! Apart from the raisin sweetness (a mix of dark raisins and sultana raisins) there is also some kind of ovenbaked-red-apple-slices-sweetness and in the distance sweetness from cooked beetroot together with a touch of woody elder flower. In the layer above the sweetness we have something else going on, something a tad ”funky”, that involves quite evident notes of old wood/cask, old marzipan, moist almonds, and leather, combined with a faint touch of turpentine and/or yeast. Perfectly integrated in this layer we have a mediumsoft peatyness lurking around… all in all a very intriguing nose, with absolutely no sign whatsoever of the high ABV, a nose that I could sit and nose and nose on and on for a very long time. So interesting that the nose and taste differs so much from each other in so many ways (for instance how different the ABV is felt on the nose vs. on the taste; a really powerful dram tastewise). Interesting also that the funky stuff from the nose actually appears on the taste aswell. My favourite stuff from the nose is definitely the sweetness together with the peatyness, and from the taste the first phase together with the dryness in the third phase and also I like the fourth phase. This whisky is definitely a must-purchase-whisky, not only because it’s from a defunct swedish distillery but also since it’s a whisky that tastes soo different from how it behaves on the nose. All in all, a great cask selection! Finally, big thanks to Peter at Svenska Eldvatten for the opportunity to review this whisky before its release! For kind of weekly updates please make sure to follow my FB-page by clicking here, my instagram by clicking here, and my twitter-page by clicking here. Copyright © and All Rights Reserved on all tasting notes and text by SamuelWhisky and pictures and videos likewise belong to SamuelWhisky, unless stated. If you would like to use any such material that belongs to SamuelWhisky or associated with SamuelWhisky, please ask by sending me an email to samuelkarlssonorebro [at] gmail [dot] com and by stating the source.